Headband giveaway winner & Nail art rhinestones | Memorable Days : Beauty Blog - Korean Beauty, European, American Product Reviews. It's Rinny !!! Congratulations ^__^! It must be your lucky week =D. I will email you today, so keep an eye on your inbox. Don't worry everybody I will have a new giveaway soon and it will be worldwide so stay tuned ;). Remember my previous blogpost about the free hello kitty stamping plate and rhinestones? I finally received the free rhinestones as well ;). The rhinestones were all messed up when it arrived =(.. but yeah I'm happy that I received it ^__^. 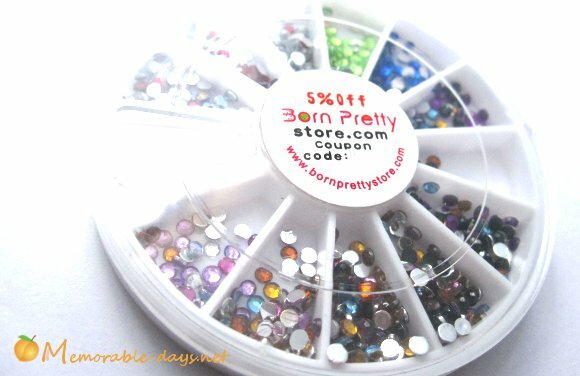 Have you received your Born Pretty Store products already? @Jennifer, ahww, i'm happy to share it with my followers ^o^~! mine are quite small as well =/ will do a tutorial soon hihi ^^ ! @Rinny, you're really a lucky girl this week haha ='D ! !